With exceptional analysis capabilities for both rock and soil, RS2 is your go-to software for modeling and analyzing slopes, surface and underground excavations, groundwater seepage, consolidation and much more. Powerful, multi-core parallel processors allow you to solve complex finite element problems quickly and easily. 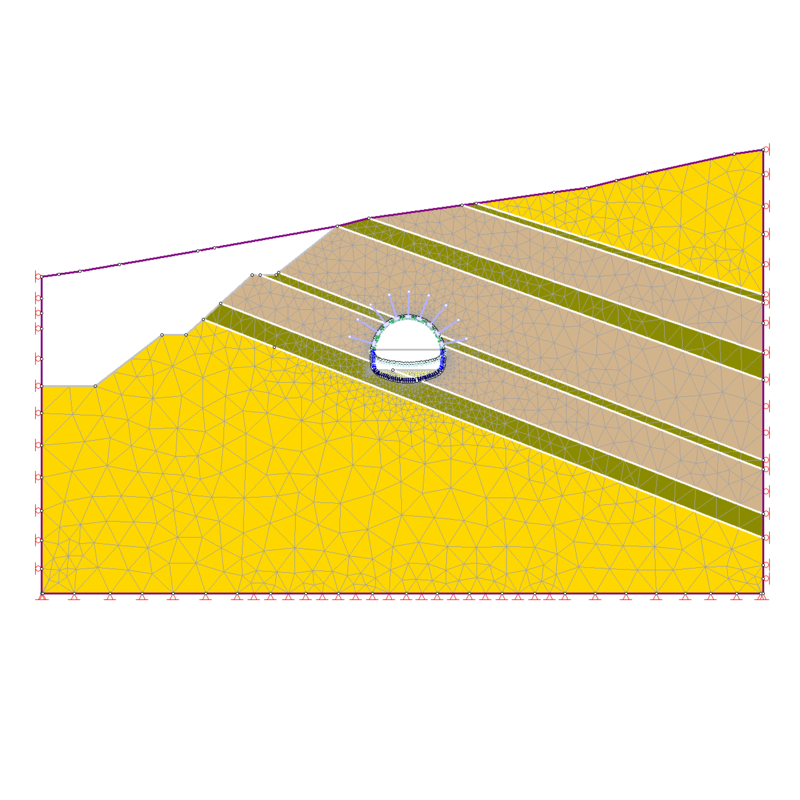 RS2 (Formerly RS2 or Phase2) is a powerful 2D finite element program for soil and rock applications. RS2 can be used for a wide range of engineering projects including excavation design, slope stability, groundwater seepage, probabilistic analysis, consolidation, and dynamic analysis capabilities. Complex, multi-stage models can be easily created and quickly analyzed – tunnels in weak or jointed rock, underground powerhouse caverns, open pit mines and slopes, embankments, MSE stabilized earth structures, and much more. Progressive failure, support interaction and a variety of other problems can be addressed. 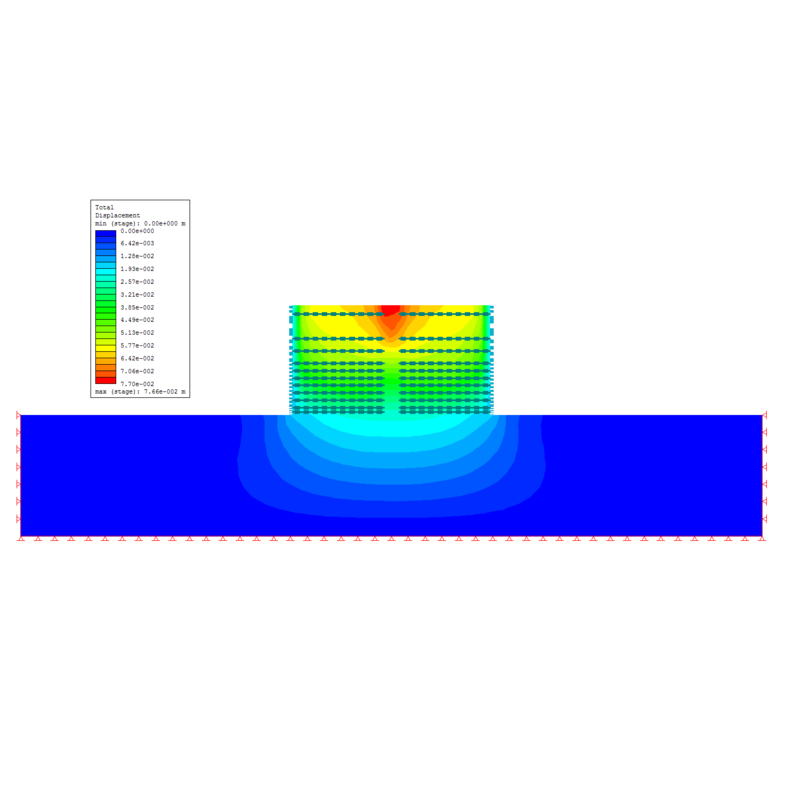 One of the major features of RS2 is finite element slope stability analysis using the shear strength reduction method. This option is fully automated and can be used with various failure criteria, including Mohr-Coulomb and Generalized Hoek-Brown. Slope models can be imported or exported between Slide2 and RS2 allowing easy comparison of limit equilibrium and finite element results. With 64-bit and multi-core parallel processing options RS2 can solve larger and more complex models in shorter times. RS2 2019 is a significant upgrade to the previous version (RS2 v9.0), featuring improvements for material models, Slide2 integration, and more. 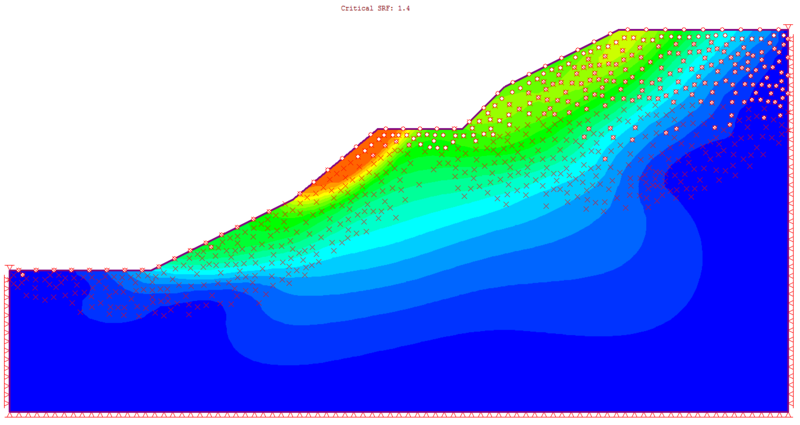 The addition of Slide2 material models to RS2 now enables seamless transition of slope models between the two products. Sharing the same material models allows RS2 and Slide2 to be used in conjunction, resulting in a unified and therefore better user experience. More importantly, when users import a Slide2 model into RS2, the 1:1 correlation between materials means they can make a more accurate comparison between the model’s limit equilibrium (LE) and finite element (FE) analysis results to determine the reliability of the factor of safety (FS). Hydraulic properties are now found in the Material Properties dialog for increased ease of use. Initial transient pore pressure is now defined by individual material. Wick drains can now be added to groundwater models. Improved loading capabilities in RS2 allow users to add multiple loads to one location on a model. Furthermore, improvements were made to the Add Load interface which allow loads to be added with a simple click and drag system. Get more done with approximately 50% faster SSR analysis. Uncoupled Consolidation Uncoupled Consolidation is a new analysis type that will improve the stability and speed of consolidation analyses. As with most CAD programs, features such as grids, snapping, and undo are implemented to greatly simplify the process. Any person who has used a CAD program like AutoCAD will have no problem understanding and using the RS2 geometry modeler. RS2 incorporates state-of-the-art editing tools which allow you to perform simple or complex editing tasks with a few mouse clicks. Boundaries and other entities can be moved, deleted, copied, stretched etc. Convenient right-click shortcuts are available for most editing options. RS2 also features model creation tools to help with boundary simplification, geometry cleanup, and much more. A Visualization Tree pane has been added to the modeling interface in RS2 2019 to facilitate the visualization of model components by presenting most model entities such as loads, groundwater boundary conditions, liners, and more in a tree format. This tree allows users to toggle the visibility of an item on and off, as well as perform other operations including zooming in on and deleting an item. One of the most exciting features of RS2 is finite element slope stability using the Shear Strength Reduction (SSR) method. This option is fully automated and can be used with either Mohr-Coulomb or Generalized Hoek-Brown strength parameters. With a single mouse click, you can run the SSR analysis and determine the critical strength reduction factor (safety factor) of a slope. The SSR method has many advantages over the traditional limit equilibrium methods of slope stability. 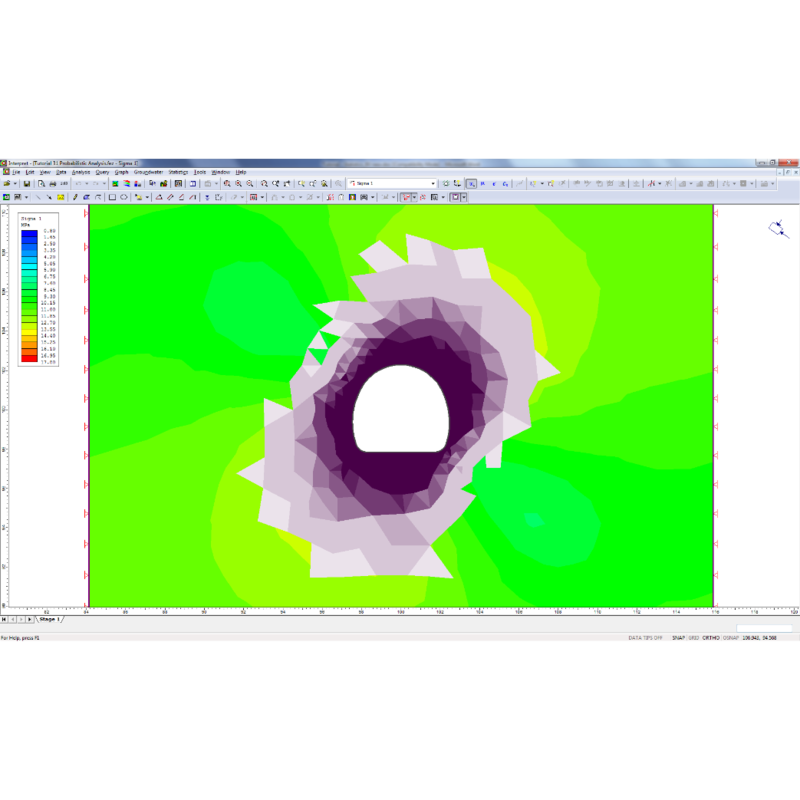 For example, SSR analysis does not require any assumptions about the shape or location of the failure surface. The SSR method will automatically determine the most critical failure mode and the corresponding safety factor. For more information about SSR analysis with RS2 see the Shear Strength Reduction Overview topic in the RS2 Online Help. RS2 includes steady-state and transient, saturated-unsaturated finite element groundwater seepage analysis built right into the program. 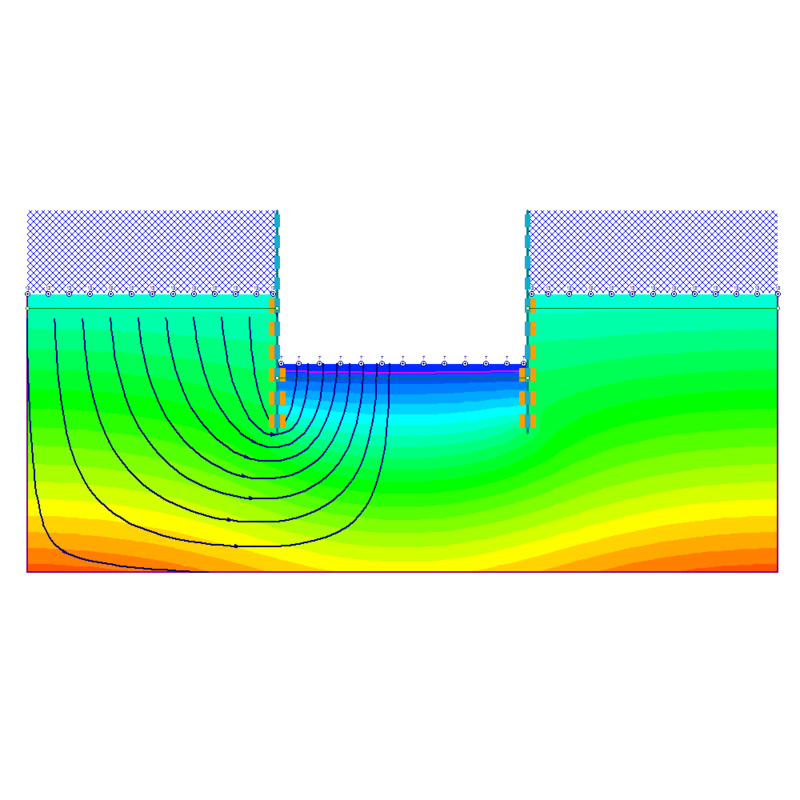 Coupled solid-fluid formulation is also available for consolidation problems. There is no need to use a separate groundwater program; the seepage analysis is fully integrated with the stress analysis in RS2. The pore pressures computed from the groundwater analysis are automatically used in the stress analysis to compute effective stress. Other quantities are also calculated such as flow rate, hydraulic gradient and discharge velocity. The groundwater seepage analysis in RS2 can be used as a standalone groundwater program, independently of the stress analysis functionality. RS2 offers probabilistic analysis using the point estimate, Monte Carlo, or Latin Hypercube methods. For an RS2 probabilistic analysis you must define one or more input random variables (e.g. material strength, modulus, etc.). You can define material properties, joint properties and field stress as random variables. Only the mean and standard deviation need to be defined, the statistical distribution of each variable is assumed to be normal. Joint network modeling is a powerful feature in RS2, which allows you to easily generate two-dimensional networks of joint boundaries to simulate patterns of natural or induced jointing in rock masses. Liners may consist of beam elements which can resist axial, bending and shear forces, or truss elements which only possess axial properties. In all cases, the basic support properties of the liner are entered in the Define Liner Properties dialog. The reinforced concrete liner type greatly simplifies the task of modeling composite two-component liner systems such as reinforced concrete, or steel sets and shotcrete. Schematically, a Structural Interface consists of a support element sandwiched in-between two joint elements.